7 Natural Hair Style Tutorials for a Glam Valentine's Day! Volume and va voom are what these seven YouTubers are giving us with their seductive styles. Your mate will have to fight off the stares of onlookers with all these alluring curls and updos when you go for a night out on the town. Want to protect your ends while looking romantic for Valentine’s Day? For ladies with medium-long curls,KnottiKurls shows you how to create a textured updo that protect those ends. This style only requires a brush, bobby pins and twists. To achieve voluminous curls without rollers or heat tools, BeeUtifullyMade teaches you how to set bouncy heatless curls that would be perfect for a dinner date. All you need is moisturizer, bobby pins and a setting product. 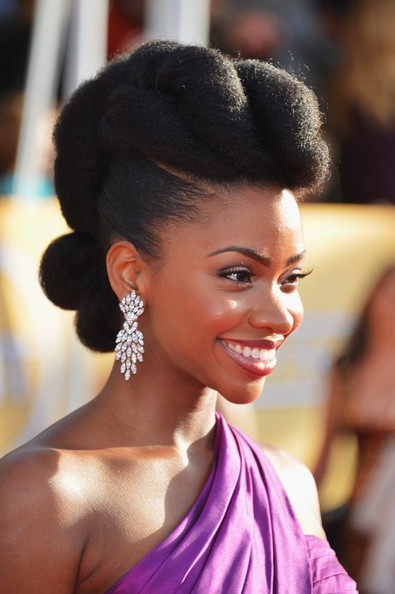 The beautiful updo that Teyonah Parris wore for the SAG Awards was the talk of the blogs last year and it's still catching us by storm. Ms. VaughnTV recreates this fierce look on her channel. She achieves this look with three ponytail holders, a few bobby pins and a brush. Can’t beat that! Romantic Half UpdoIndecisive as to whether you want to wear your hair up or down? Do both! Alicia James has a Romantic Half Updothat incorporates braids, curls, and pins. If you don’t have a curl wand, doing a bantu knot out in the back will achieve a similar look. Bigger is always better and another pompadour options is the Statement Pompadour by Naturally Curious. Depending on the length of your hair, this style may also require stretching. If you want a loc style that’s not your typical updo, Chescalocs has a fun bob style called Curly Girl Pinup. This style gives you a dreamy look for your hot date without leaving your head feeling heavy. For a twist out with lots of volume and defined ends, India from MyNaturalSistas teaches you how to create a Heart Shaped Twist Out that’s fun and flirty. This style is very enchanting and gives lots of lovely volume.